2 Melt Spread in 3-quart saucepan over medium-high heat and cook onion, stirring occasionally, 3 minutes. 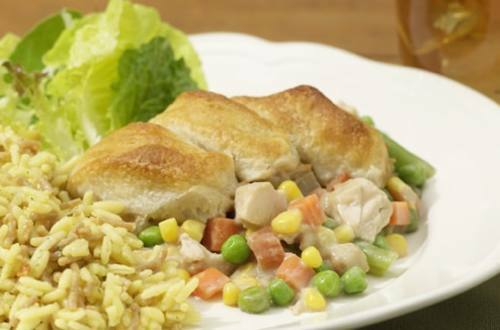 Stir in mixed vegetables, turkey, water, milk and Knorr® Roasted Turkey gravy mix. Bring to a boil over high heat, stirring occasionally. Reduce heat to medium and cook, stirring frequently, 3 minutes. Spoon into 2-quart casserole. Halve biscuits, then arrange on turkey mixture cut sides down with edges touching. 3 Bake uncovered 25 minutes or until biscuits are golden brown. Eat your Thanksgiving leftovers with a spoon. Our Day After Thanksgiving Soup recipe transforms holiday dinner scraps into a soup you’ll want to eat everyday.